With Thanksgiving now past, thoughts of the community turn to Christmas as the happiest and gayest season of the year. Wayne will present its usual picture of sidewalks crowded with holiday shoppers; of stores, beautiful both on the exterior and interior, and in the evenings, strings of multicolored overhead lights will add their sparkle to the scene. As the holiday season progresses, the two main community Christmas trees, and other small ones scattered through the township, will be trimmed with their strings of gay colored lights in anticipation of the carol singing, held shortly before Christmas Eve. The intersection of Walnut and North Wayne avenues as it looked in the middle 90’s as shown in one of the Harry M. Buten postcards. In the foreground is the triangle of ground on which the North Wayne community christmas tree is now planted. The main community Christmas tree is located on Lancaster pike on the grounds of the old chapel of the Wayne Presbyterian Church. But while this Christmas tree belongs to ALL Wayne, North Wayne also has one of its own, located on a spot that seems built to order for that purpose. This is the triangular piece of ground in the center of the wide opening of Walnut avenue onto North Wayne avenue. In 1951 the purchase of this handsome Nordman fir was sponsored by the North Wayne Protective Association, which in the intervening five years has been responsible for its constant care and for its Christmas lighting, as well as for its evening of carol singing. The triangle has been there ever since Walnut avenue became a residential street in the 1880’s when the Wayne Estate started to build homes. In a series of “Your Town and My Town” articles written several years ago, based on information given the writer by George M. Schultz, an old time resident of Wayne, the latter described Walnut avenue as he knew it when he came to this community as a very young man. According to Mr. Schultz, it was the first real residential street in the rural community. With its newly built homes, Walnut avenue had a rather barren look, since most of its present widespreading trees were saplings and the now thick hedges had not been planted. Since the trees in the postcard picture are of moderate size and the hedges are a few feet high the picture was undoubtedly taken several years later, probably in the middle 1890’s. Both vehicles in the picture are horse drawn – the one on the left being a wagon, perhaps the property of a gardener on the corner property. The vehicle on the right is much like one in a picture lent by Mr. Schultz several years ago to illustrate an earlier article, except that one had two seats placed back to back and accommodated four riders. At the time, Mr. Schultz named this type of pleasure vehicle a “dog cart” and said it often had a lantern attached to it for night driving purposes. 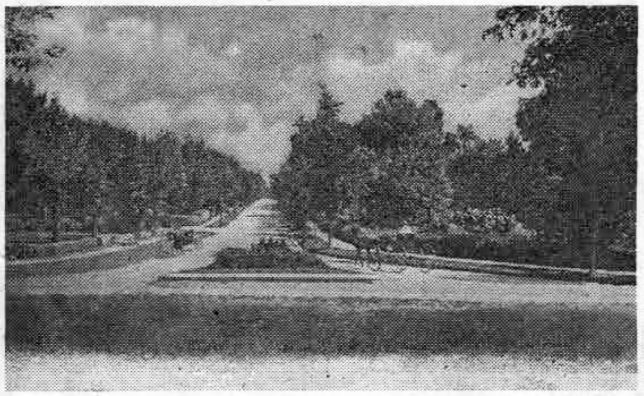 With the help of this picture the eyes and minds of the many who pause to admire the beauty of the Nordman spruce at Christmas time may visualize the intersection of Walnut and North Wayne avenues and the long vista of Walnut avenue, as they looked in the 1880’s. 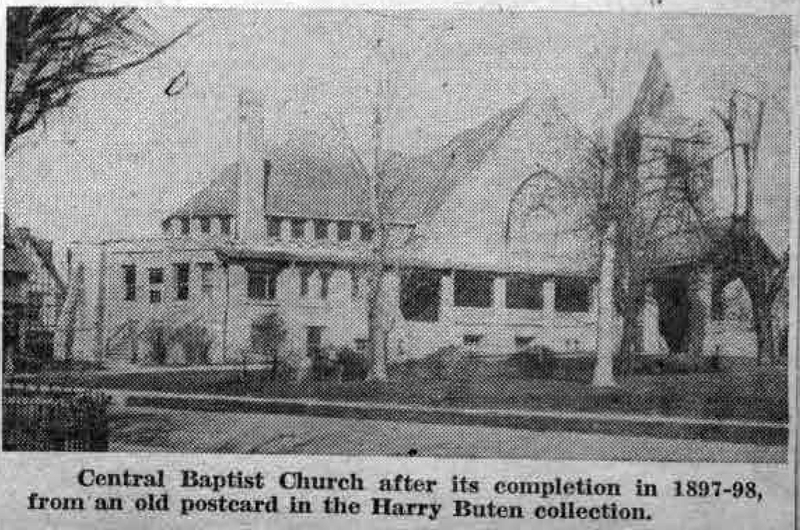 This series of three pictures is particularly interesting at this time, following as it does the publication, in “The Suburban” last September 7, of the picture of the new education building of the Central Baptist Church. This recently completed addition was dedicated on Sunday, September 9, 1956. This small building, which once stood on the corner of Conestoga road and West Wayne avenue, was the first church home of the early Baptists in this community. It was a gift made in 1841 to the congregation by William Siter, in whose home meetings previously were held. 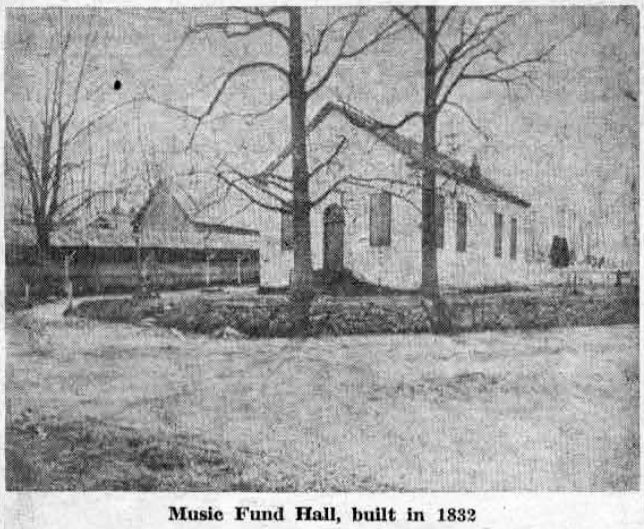 Often meetings were held in the small building which in its remodeled form still stands near the recent site of the Music Fund Hall. This handsome edifice was built on the former site of the Music Fund Hall in 1890. However, only six years after its completion, a special business meeting was called “for the purpose of considering the advisability of securing a location for our church and rebuilding near the center of town” (quoted from the minutes of the meeting). 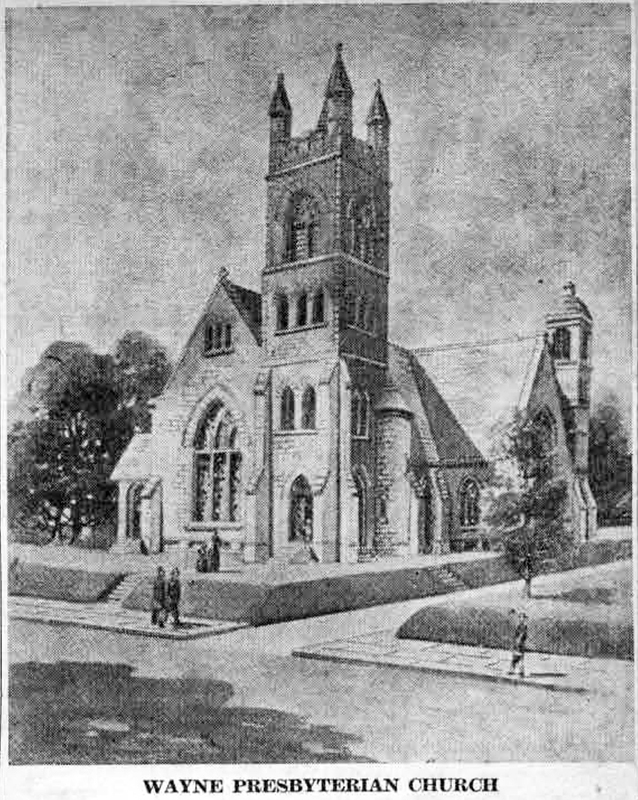 After several subsequent meetings, a resolution was passed “to form a new Baptist Church in Wayne and to build on a lot on Lancaster avenue west of the Trust Company.” Soon thereafter, the Central Baptist Church was built on its present site and for more than 30 years there were two Baptist churches in the small Wayne community. 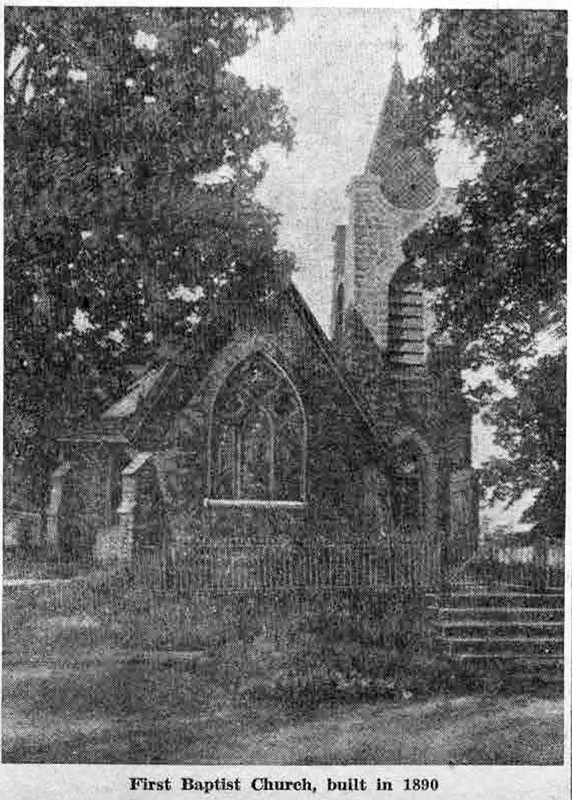 In January, 1929, services were discontinued in the old church on Conestoga road and in 1951 the building was demolished. A hardware store was built on the site. Among the old picture postcards of Wayne that this writer received recently from Mr. Harry M. Buten, of Merion, are the two shown in today’s column. Although not a collector of postcards, Mr Buten has been able to tell this writer something of their history. This ruling remained in effect until 1907, when the address side of cards was divided into two sections by a middle line. The left section was labeled, “This space may be used for correspondence,” the right, “This space is for the address only.” In this connection, it is interesting to note that the picture postcard of the library must have been printed before 1907 and that of “The Waynewood” after that date, since only the latter has a message space on the address side of the card. When the story of the founding and subsequent history of what is now the Memorial Library of Radnor Township was told in this column some months ago, a fruitless search was made for a clear picture of the small stone building, erected in 1893. The picture that was finally printed was dark and indistinct and in no way compares with the very clear one shown in today’s column. 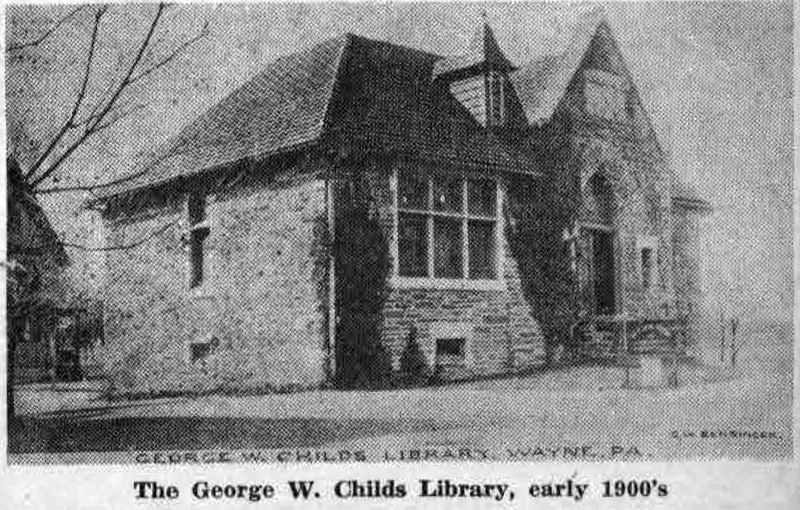 At that time the library was known as the George W. Childs Library, since the ground on which it was built was a gift from Mr. Childs, a Philadelphia philanthropist, who had many real estate interests in the newly-developed community of Wayne in the closing years of the 19th century. The transfer of library books was undertaken by wheelbarrow from the old quarters to the new. Since the former was on North Wayne avenue, this necessitated crossing the pike with each load. And even when pike travel was entirely by horse or bicycle this must have been a tedious process. The building pictured above still remains as part of the present greatly enlarged Memorial Library of Radnor Township, erected in 1949 in memory of the men and women of Radnor Township who gave their lives in World War II. This view of the building, as it originally looked, is taken from the east side with the old Wayne Presbyterian Church just to the west of it. Many of the trees shown in the picture have now disappeared, while others show the tremendous growth that the years have brought. The building remains much as it was when it was built more than 50 years ago. From time to time reproductions of others of these old postcards of Mr. Buten’s will appear in this column. 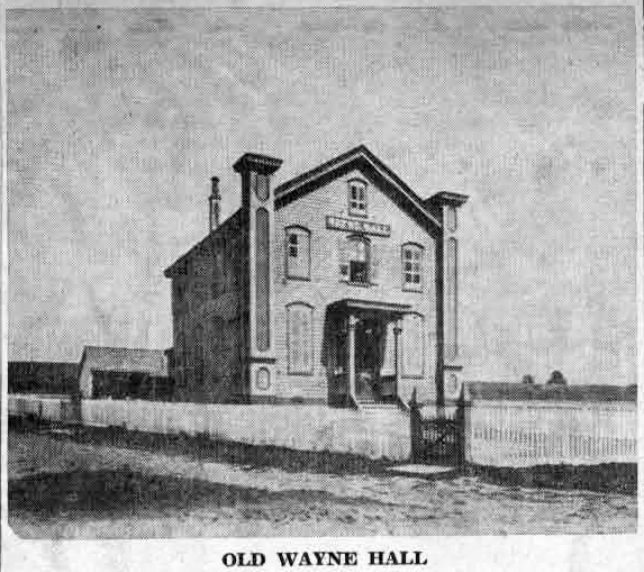 “On Sabbath morning, June 5, 1870, a service was held in Wayne Hall… on the 19th of the same month a Sunday School began with five children. On the 21st a meeting occurred at the Hall, preparatory to the organization of the Church. “The Presbytery appointed as Commission Rev. Dr. B.B. Hotchkin, Professor Lorenzo Westcott, Rev. T.J. Aiken, and Ruling Elders James Moore and Thomas Aiken, who met in the hall on the 24th of June A.D. 1870 and organized the church with nine members, installing Howell Evans as ruling elder. “Rev. Samuel P. Linn was installed pastor July 5th, 1870. Rev. Dr. T.W. Dale was moderator. Rev. Dr. R.H. Allen preached; Rev. Professor Lorenzo Westcott delivered the charge to the pastor and the Rev. B.B. Hotchkin, D.D., delivered the charge to the people and a prayer was offered by Rev. John Chambers. “Services were held in the Hall until the church building, now known as the chapel, was finished. Ground for this was broken March 21, 1870. The cornerstone was laid on Thursday May 12, by the Rev. John Chambers, with appropriate services, assisted by Rev. R.H. Allen, D.P ., Rev. John McLeod and Rev. T.J. Aiken. The services were solemn and impressive, witnessed by a large audience from the surrounding country and the city. All hearts were cheered as the bright sunshine came down through the darkened clouds and seemed to smile on the servant of Christ as he invoked God’s blessing upon the future church. Other eminent divines from nearby churches took part in the afternoon and evening exercises. The churches, as well as the parsonage, which was located a few blocks east on Lancaster pike, and the endowment of both, were gifts of J. Henry Askin, under whose personal direction the new building was erected. 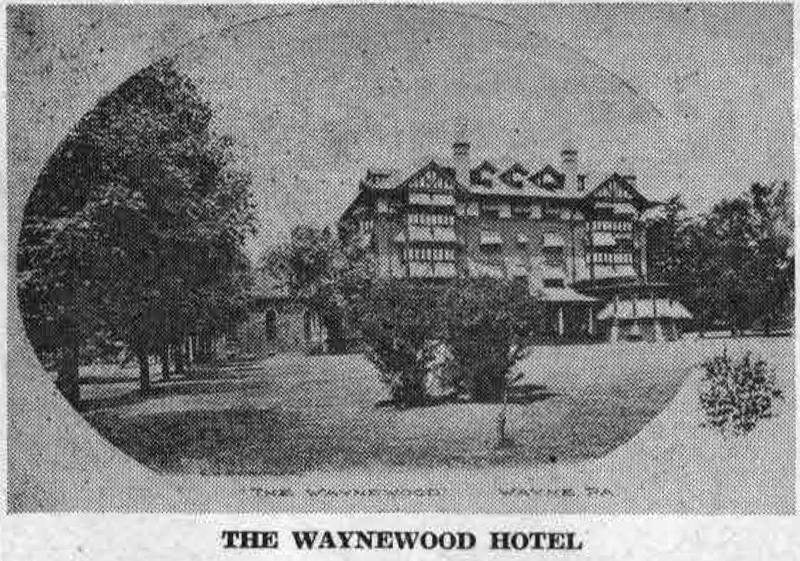 They were a memorial to his parents, established by a man who has sometimes been called the “founder of Wayne.” He built Louella Mansion, now the Louella Apartments, as his family home. 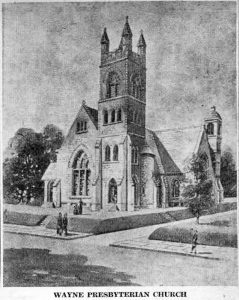 On May 12, 1892, the corner stone of the present Presbyterian Church was laid, just to the west of the original edifice. The author of “Rural Pennsylvania” describes this second building as a “stately and costly structure of early English Gothic style of architecture.” The Rev. William A. Patton, who has doubled church membership in his two-year pastorate, was minister of the church. With some alterations and additions, the Wayne Presbyterian Church looks now much as it did when it was built 64 years ago.